Lenda's customer service is always there. One of the few lenders that give you options and is always a phone call away. They will walk you through everything. You get service from educated people, who know what they are doing. Not a used car salesman. 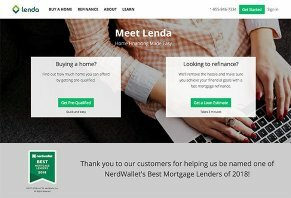 Lenda will give you multiple options on the rate and buy down. Also, they give you a little education on the benefits! Since I bought my house as an investment, Lenda gave me a loan that is thousands less over the three years I expect to be in this home. I was given interest rate options at different buy-downs. I work lots of hours, night shifts and value my time. Lenda worked with my schedule, on my terms and provide truthful cost analysis. I knew what I wanted, and Lenda was open and willing to give me the loan with the lowest cost over three years.